Gwen Gould has enjoyed a diverse career as a recitalist, artistic director, conductor, and entrepreneur. She founded the West Village Chorale (1971), Columbia Festival Orchestra (1988), Diamond Opera Theater (2004), and two chamber music series, ClaverackLanding (2010) and Classics on Hudson (2015). A national competition finalist, Gwen performed extensively as a solo recitalist and developed a career as an organist and director of music in New York City. She performed recitals throughout the Northeast and in many churches in New York City including St. Thomas’ Church, Trinity Wall Street, St. Michael’s Episcopal Church, St. Paul’s Chapel of Columbia University, and the Cathedral of St. John the Divine, among others. As a choral conductor, Ms. Gould founded and then conducted the West Village Chorale for 27 years, presenting major choral works with orchestra, and establishing WVC’s popular program of Summer Sings in 1972. She was a frequent guest conductor for the New York Choral Society’s Summer Sings as well. As founder and conductor of the Columbia Festival Orchestra, based in Hudson, NY, she presented concerts in many different venues in Columbia County and the Berkshires, including The Hudson Opera House, The Shaker Tannery, Spencertown Academy, Shaker Museum & Library, PS21 (Performance Spaces for the 21st Century), various churches in Hudson, Chatham, and Great Barrington, as well as at Tanglewood’s Ozawa Hall, and Merkin Hall in NYC. Guest artists included Paula Robison, flute, Kenneth Cooper, harpsichord/piano, Metropolitan Opera bass-baritone John Cheek, Ani Kavafian, violin, Carol Wincenc, flute, Susan Jolles, harp, Arnold Steinhardt, violin, Lincoln Mayorga, piano and composer, Jay Ungar and Molly Mason, fiddle and guitar, Allan Dean, trumpet, Yehuda Hanani, cello, Simone Dinnerstein, piano, Gwyneth Walker, William Perry and Sheila Silver, composers, and Peter Schickele, composer and narrator. CFO presented premieres of works by American composers Sheila Silver, Lincoln Mayorga, Nancy Laird Chance, William Perry, David Grunberg, and Thomas Beveridge. One of the CFO’s most successful programs was the annual outdoor “Salute to America” concert. for full orchestra and chorus with prominent guest artists, held on Independence Day weekend at the Shaker Museum and Library in Old Chatham. It became a much-anticipated annual county event. In a setting rich with local history, the CFO showcased the works of living American composers in programs that were fun and entertaining for the entire family. As a poet, Gwen has published a chapbook Luminations and is a contributor to another chapbook Java Wednesdays by the Java Poets Collective. She has had poems published in Chronogram Magazine and Our Berkshire Times. 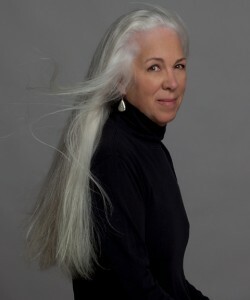 Her poem Black Beauty (about her piano) has been set to music by award-winning composer Sheila Silver and was performed for the first time in March 2013 at Club Helsinki by Nina Fine, mezzo-soprano, with the composer at the piano. A free download of this song will be available soon. Gwen and her husband Ed Grossman founded an IT staffing company JSL Computer Services, Inc. in New York City in 1978, which they continue to run from their office in Hudson, NY. Ms. Gould received a Bachelor of Music from DePauw University in Greencastle, Indiana, and a Master of Sacred Music from the Yale Institute of Sacred Music/Union, and held teaching posts at Stuart Hall in Staunton, VA, and at St. Luke’s School, NYC. She currently serves on the Advisory Boards of Hudson Hall, Concerts at Camphill Ghent, Kids Need Music and the West Village Chorale. CLICK HERE for A Personal History in Music.